Walter Rosenblum has been a photographer for fifty years, as well as an important figure in the advancement of twentieth century photography. His early involvement with photography began when he was seventeen years old, when he joined the Photo League where he met Lewis Hine and studied with Paul Strand. As a World War II U.S. Army combat photographer, Rosenblum landed in Normandy on D-Day morning. There, he joined the anti-tank battalion that drove through France, Germany and Austria; he took the first motion picture footage of the Dachau concentration camp. Rosenblum was one of the most decorated WWII photographers, receiving the Silver Star, Bronze Star, five battle stars, a Purple Heart and a Presidential Unit Citation. The Simon Weisenthal Center has honored him as a liberator of Dachau in WWII. His photographic career spanned major events of the twentieth century; he photographed the immigrant experience in America, WWII, Spanish Civil War refugees, and in East Harlem, Haiti, Europe and the South Bronx. Rosenblum has had an extensive teaching career, beginning in 1947 at Brooklyn College. He also taught at Yale Summer School of Art and Cooper Union, as well as abroad at the Rencontre de La Photographie in Arles, France and in Sao Paolo, Brazil. In 1980 he received a Guggenheim Fellowship for his project "People of the South Bronx". 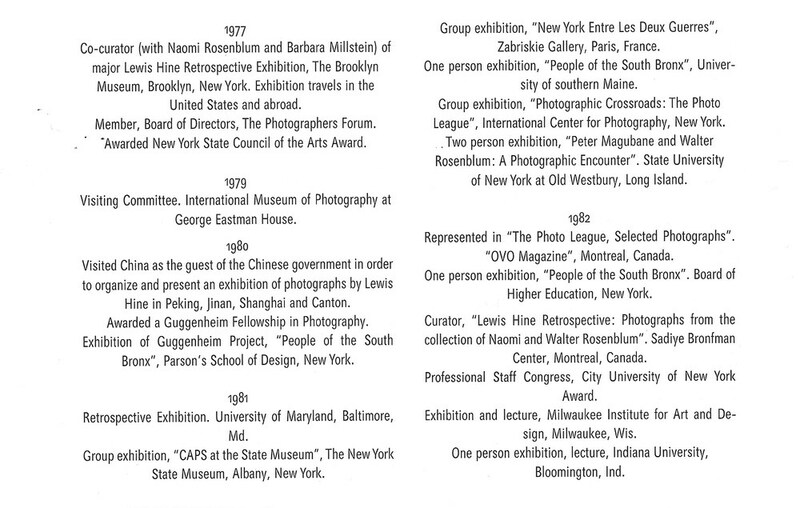 Together with his wife, renowned photographic historian Naomi Rosenblum, Rosenblum curated international exhibitions including the Lewis Hine Retrospective. His photographs are represented in more than forty international collections including the J. Paul Getty Museum; Library of Congress, Wash. DC; Bibliotheque Nationale, Paris; Museum of Modern Art, NY. 'Walter Rosenblum: In Search of Pitt Street', an award-winning film about Rosenblum's life and work was produced by Daedalus Productions, Inc. in 2000.